I have a thing about marketing. Yes, I’m a marketer, but I’m not a traditional marketer. I’m more your guerilla marketer (although I was a very hairy baby so “gorilla” is perhaps more fitting), and I actually have a few principles; one of them being that I won’t market anything that involves deceiving people. But others aren’t quite so principled. Take Unilever’s Flora range, for example. Unilever’s advertising would have us believe that their products are actually better than the very things they’re replicating. Things like butter, and olive oil. Better than these. So, let’s play a game. Guess how many ingredients are in “Flora Buttery”. Ok, I’ll tell you. It’s 14. Vegetable oils in varying proportions (70%) (sunflower, rapeseed, palm and linseed), water, BUTTERMILK (12%), salt (1.5%), emulsifier (mono- and diglycerides of fatty acids), citric acid, preservative (potassium sorbate), natural flavouring (contains MILK), vitamins A and D, colour (carotenes). Sounds delicious, hmmm..? Get it on your crumpets. Or maybe not. 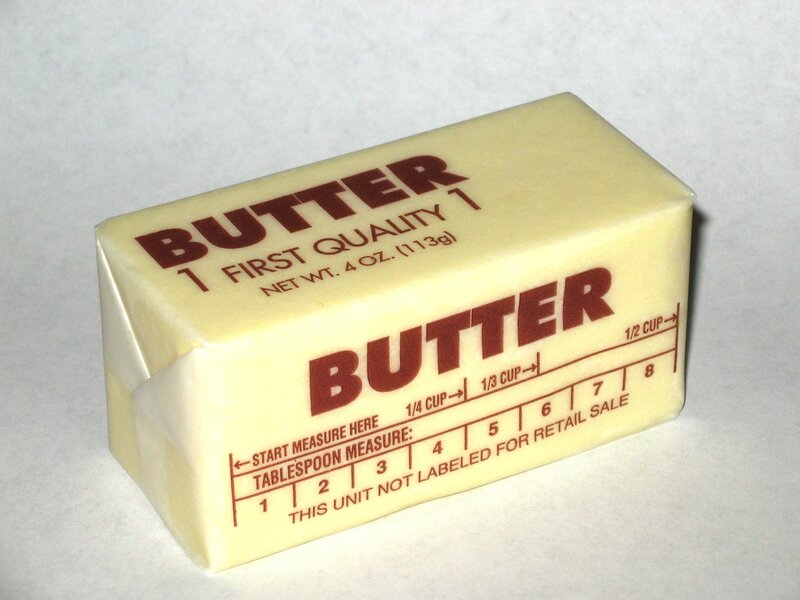 Ingredients in butter? Erm…butter (well, cream actually). And then we have Flora Cuisine: a “yummy” liquified version of Flora margarine that Unilever are peddling as a healthy alternative to olive oil – with a mere 16 ingredients, this time. Yes, you heard that right. They used to say this outright but have obviously had their knuckles rapped for being economical with the truth (ie blatant lying), so instead they’ve put in it shifty Markety Flim-Flam™: “And because it’s lower in saturated fat than olive oil and high in omega 3, it’s a healthy choice too”. Okaaaaay. Well, aside from the fact that Unilver are implying that their lab-created concoction is better for us than (pure, natural) olive oil, 1: olive oil contains only 14% saturated fat anyway, and 2: despite what some food companies want you to believe, natural saturated fats are not bad for you after all: http://www.nhs.uk/news/2013/10October/Pages/Saturated-fat-link-with-heart-disease-questioned.aspx. More on that in another post. Oh, and ingredients in olive oil?? Oil. From olives. I don’t need to quote that well-worn “margarine is two molecules away from plastic” internet story at you for you to know that this sort of chemically produced stuff is just not good for us. This sort of non-food is what makes people ill – not natural fats, saturated or not. This and, of course, sugar (not called The White Death for nothing). Companies who sell this kind of product are opportunists with massive marketing budgets, making equally massive profits out of selling cheaply-made fake foods to unsuspecting consumers in what is a very murky marketplace that favours big food corporations and their expert lobbyists. My advice? Don’t touch anything that should contain one or two ingredients yet has 15 – let’s face it, it’s never going to be nice, is it? Eat natural food that’s good for you and your body, and tastes fantastic – like butter, olive oil, coconut oil and even lard. Yes, lard – or better still, dripping! Fry your eggs in it, make yorkshire puds with it and stick it in your pastry. We humans evolved eating natural fats so they must be good for us. This is my logic and I’m sticking to it. Turns out Mother Nature is a motherfeckin’ GENIUS after all! Who’da guessed..?! PS – and Unilever, the company that makes Flora? A multinational company, one of the petrochemical industry’s biggest customers, and the people who very likely make your detergent, your bleach and your shampoo. They also make the truly abominable “I Can’t Believe it’s Not Butter”. Enough said.